My cousin Emily and her boyfriend Josh had their beautiful little girl Anna Marie baptized this weekend. She looked like a little angel in a christening gown made from the train of my grandmother’s (Anna’s namesake) wedding gown. The event was a great excuse to make a trip to Pittsburgh and see my family, most of whom I haven’t seen since the winter holidays. And everyone looked great! At the reception I was sitting and chatting with my cousin Sarah. A while back, she learned that she has some kind of gluten intolerance and has been avoiding wheat. Unfortunately for her, this meant that she could only taste the (divine) frosting on the white almond cake from Oakmont Bakery. Boo. That’s no fun. Even our gluten-free friends should get to have some sweets. Well Sarah, this one is for you. 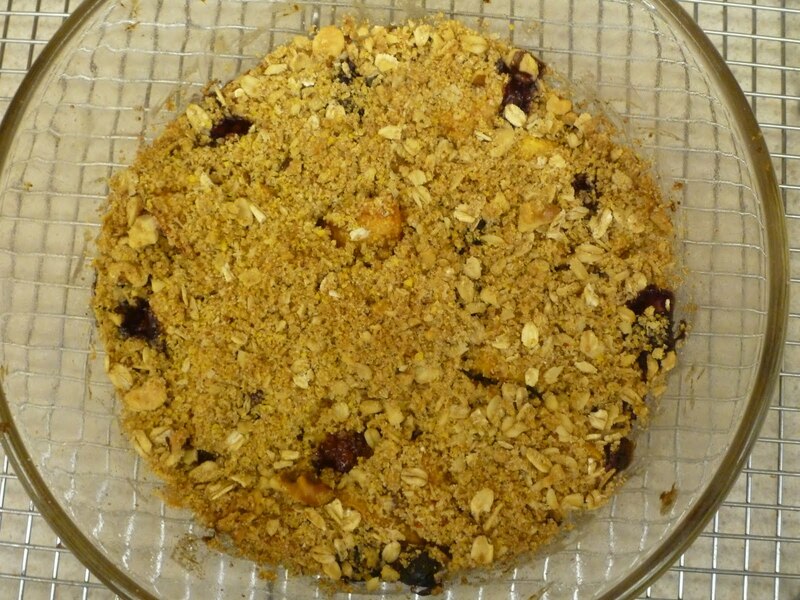 Not only is this a fairly clean dessert, but it is entirely free of wheat products and is pretty perfect for summer. Plus, it doesn’t require any babysitting—I made this during Stanley Cup Finals, and hey, I have priorities. This recipe can be doubled if you’d like to bake it for a larger crowd, but I generally only cook for two so I make it in a loaf pan or small round casserole dish. ***If you are extremely wheat or gluten-sensitive, check the label and buy a variety that is made on equipment that does not also process wheat ingredients. Bob’s Red Mill, Glutino, and Glutenfreeda are some brands that offer a specific gluten-free variety of oats. 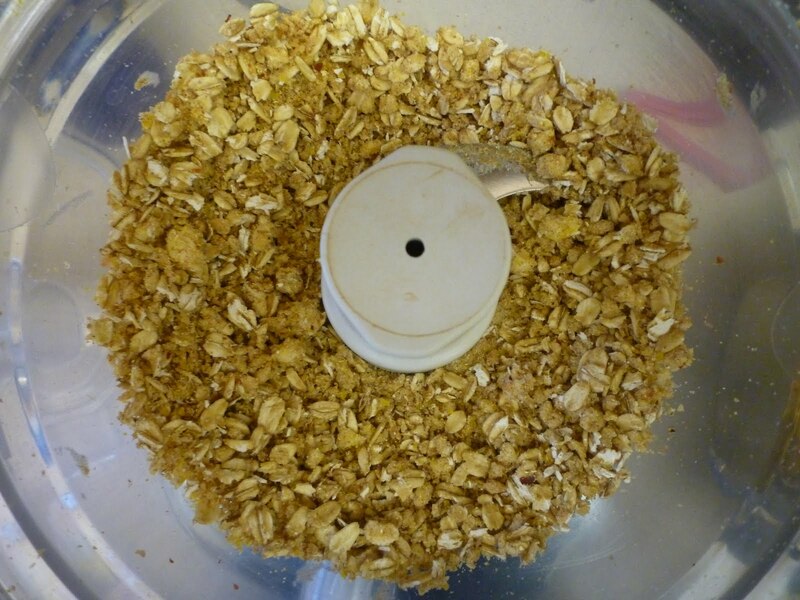 In the bowl of a food processor or a regular mixing bowl, combine the dry ingredients for the topping. If you’re not using a food processor, chop the walnuts before you add them. 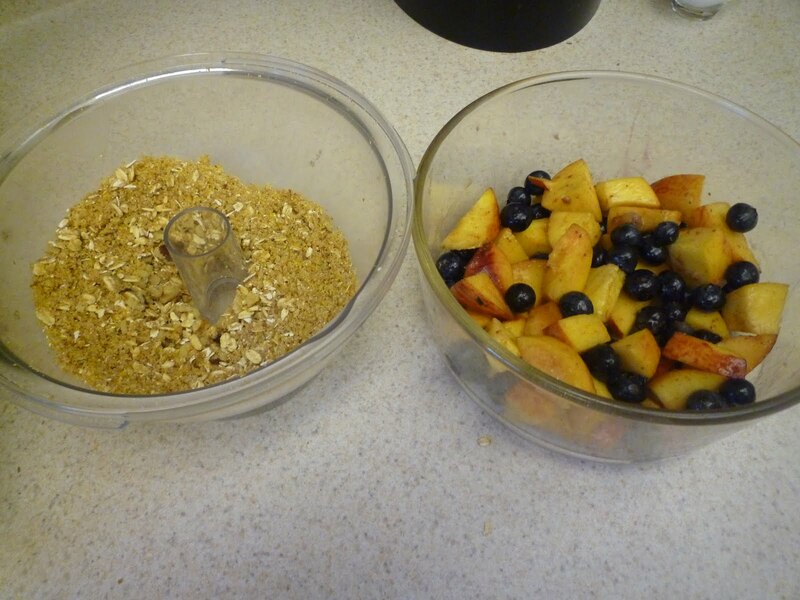 Lightly grease a small baking dish and add the fruit. 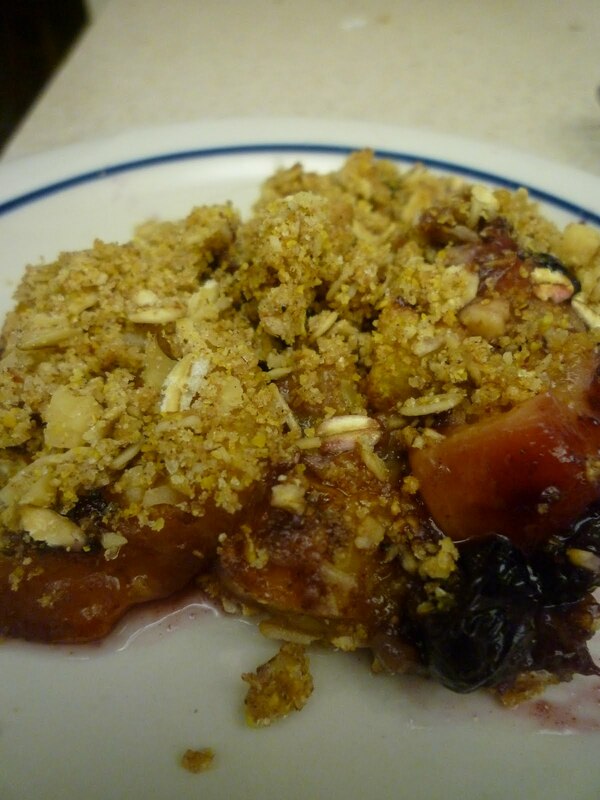 Sprinkle the crumble topping over the fruit—no need to press it down—and bake for 50 minutes or until the fruit is softened and the juices are bubbling. Heap a generous serving-spoonful onto your plate and enjoy! Share if you must.